Removing excess from my life, to say the least, is a daunting task. I decided the only way to do it is little by little, step by step. While I wish I could just bang it all out in a day or a weekend, the reality is that it took years to accumulate all of my stuff, and it will take a long time to remove it from my life. So this leads me to today’s challenge–my jeans. I’m a short, curvy woman who is “hard to fit” at times. In addition, I gain weight, lose weight, gain some of it back, lose some of it again…and my wardrobe reflects these fluctuations. So when I find something that I like, that I believe fits me well, I buy it…and sometimes I buy more than one…sometimes in different colors, sometimes not. And jeans have always been a weakness for me. 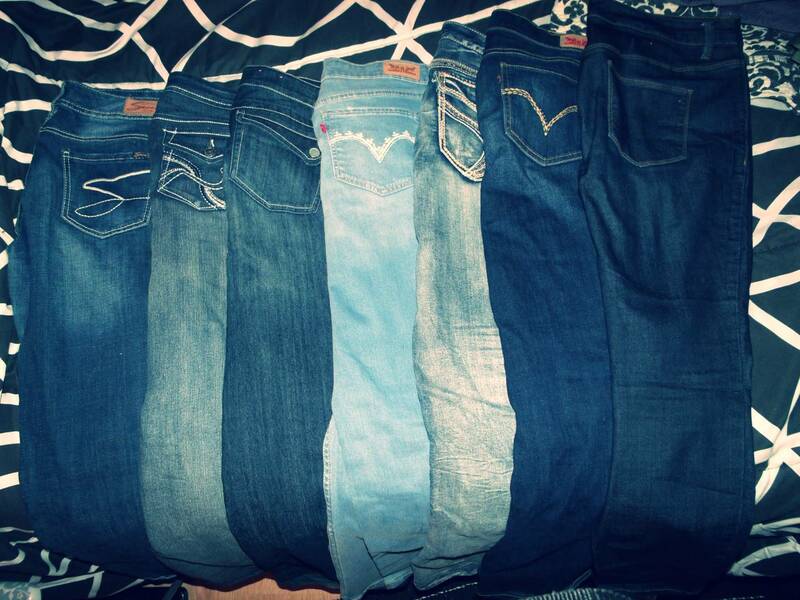 One look at my jeans pile shows just how weak in the knees I get over a nice pair of jeans. It’s ridiculous. I know this. Today’s Challenge: Pick my five favorite pairs of jeans, and remove the rest from my closet. The first step…gather up all of my jeans. Ideally, they’d all be in a drawer or somewhere neat and wonderful…but that isn’t the reality of my life. Anyways…gather my jeans from the floor, bed, closet, wherever they may be. Look at them, and give good thought to how exactly they fit and are utilized in my current wardrobe. Current is really the key here. It doesn’t matter how much I wore them two years ago if I haven’t worn them once in the last six months. There’s a reason why they keep getting bypassed…they fit weird, they aren’t in style, they aren’t comfortable, turns out they make my stomach look gigantic…something. Even if I am just subconsciously passing them by, there’s obviously something about them I don’t like…and they need to go. Next I looked for damages or imperfections. Are they ripped, torn, too long, too short? If so, time to go! I’m clearly not going to hem them, sew them, take them to the cleaners, or make whatever adjustment I’ve convinced myself I would make that I haven’t yet done. And finally, decide which ones I like. Which ones do I actually pick when it’s time to go out, which ones do I pick for casual day at work…etc. It is natural to lean towards the same few pairs when I’m getting dressed, and I typically avoid the same pairs. The challenge wasn’t as hard as I expected…however I didn’t quite get down to my goal. So maybe it was actually hard? Idk. I started at 34 pairs (GASP!! I know. Reee-diculous!! Don’t judge me.). I removed trouser jeans from consideration…wait, I have a reason. I really wear trouser jeans more as work gear, and didn’t feel like this was the appropriate category to use for whittling them down. They will be addressed once I get to the work pants challenge. So…after removing the trouser jeans and jeans with tears in them, I wound up with 27 pairs of jeans. Still absurd, I know. I pulled out the pairs that I’ve worn in the last few months, and then from that pile, I kept the ones I’ve worn in the last few months that I actually liked. Instead of the targeted five, I wound up with seven pairs of jeans that I really like. I will revisit the seven finalists and figure out which two additional pairs I can remove, if any. But for now, I feel like I’ve significantly cut down on my jeans collection, and I’m pleased with what I’ve done. The rest have been taken out of my room and will either go to someone I know or be donated. Whew! That was tough but I did it. And I’m really pleased with the selection I came up with. Various fits…bootcut, skinny, flared…some with pockets, some with no pockets…a nice variety of shading…let’s see how it all plays out in the upcoming weeks. I have high hopes. Try the challenge for yourself. Let me know how it goes!